There is something very satisfying about being the host of a gathering and bringing people together for great food and good company. But entertaining can be a daunting experience for the beginner cook, and even the more practiced need inspiration--especially when time is short. 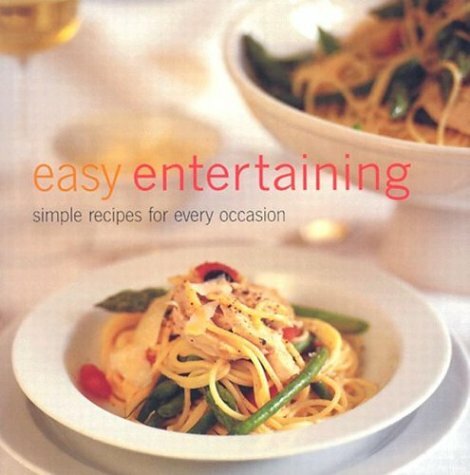 Packed with simple recipes for everything from brunch to dessert, this book is all you need to cook up a storm. Beginning with Brunch, there are some great ideas to get a leisurely morning off to a good start. With favorites like Waffles with Maple Syrup Ice Cream and savory suggestions such as Warm Potato Tortilla with Smoked Salmon, you won't be stuck for inspiration. Starters include Baked Goat Cheese and the more unusual Lemon Potato Latkes with Gingered Avocado Creme. Soups and Salads are perfect for lunch, appetizers, or a meal in themselves. From Butternut Squash Soup to Gazpacho and from Caesar Salad to Warm Chicken and Chorizo Salad, there's a recipe for every season. The Vegetarian chapter gives you plenty of suggestions to tempt the tastebuds of your vegetarian friends. Even meat lovers will be won over with Green Thai Vegetable Curry and Roquefort Tart with Walnut and Toasted Garlic Dressing. Then there are the Pasta, Rice, and Noodle recipes, which are great when you need to whip up a quick dish without compromising on flavor. For entrees, choose from Fish and Seafood, Chicken and Duck, or Meat and Game. Steamed Mussels with Garlic and Vermouth, Coq au Vin, and Steak with Blue Cheese Butter are just a few of the delights on offer. To accompany your entree, there are plenty of Sides, from something spicy, such as Chile Greens with Garlic Crisps, to something more comforting, like Classic Creamy Mashed Potato. A meal is never complete without Dessert, and this tempting collection of sweet treats will have your guests coming back for more. Who can resist Classic Lemon Tart or Sticky Chocolate Pecan Pie Finally, Party Food and Drinks offers a selection of finger food and cocktails--perfect for a sophisticated evening with friends.